Electrodes are placed on the skin to conduct a weak electrical signal. Transcutaneous electrical nerve stimulation (TENS) electrodes are part of a unit that usually is used for pain management in humans. This therapy also can be referred to as electro acupuncture. TENS electrodes typically are connected to a TENS unit by thin wires. Most units are battery-powered pocket-sized devices that emit a weak electrical current. TENS units can be used to control pain after surgery, muscle and joint pain, and chronic pain, which may be lessened and managed by the application of a weak electrical current. Typically, TENS electrodes are attached to the skin for electronic muscle or joint stimulation. They usually are held in place by a sticky patch placed over the electrodes. A weak electrical current is then passed through the electrodes into the nerves underneath the skin. When placed directly over the nerve, the current from the TENS unit replaces the pain signals that the nerves send to the brain. If placed between the brain and the affected area, the unit usually helps to block the nerve impulses. The electronic stimulation causes a tingling sensation that typically changes the perception of the pain for the patient. Placement of the TENS pads usually is important. If placed incorrectly, pain may actually be heightened instead of diminished. After surgery, the pads may be placed around the incision to capture the pain. The TENS electrodes may also be placed on the skin between the brain and the area of pain for chronic pain management. 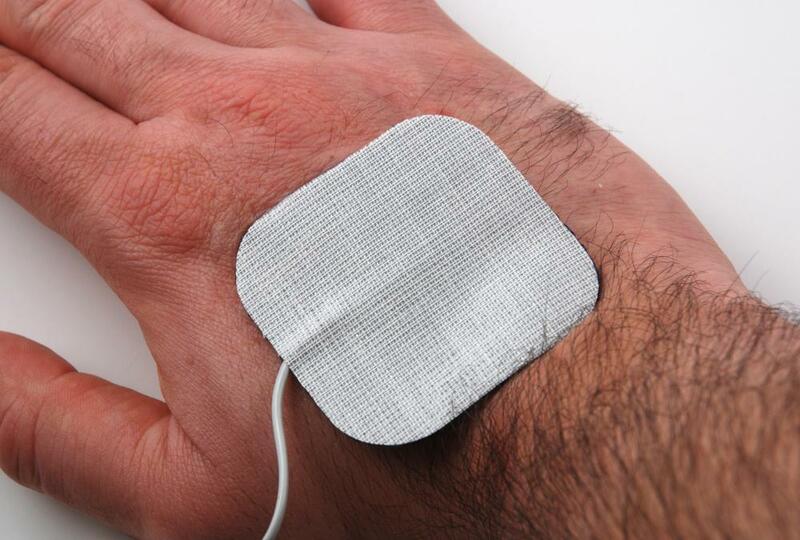 In physical therapy applications, TENS electrodes usually are placed on the skin directly above the muscle to be treated. This treatment can be effective for muscle pain, muscle spasms, and painful joints caused by an injury or overuse. For the treatment of arthritis, the electrodes usually are placed at or around the joint that is affected. TENS pain management usually is affective for chronic back pain caused by muscle spasms or spinal cord injuries. The duration of TENS treatment typically varies with the condition that is being treated. After surgery, a patient might receive TENS therapy in the hospital for three to five days. In-home pain management might be possible with the guidance of a caregiver. Patients may be required to wear their unit around-the-clock for the duration of treatment. For example, electronic muscle stimulation might require treatments once a day for three to four hours. A doctor usually will prescribe the correct duration and amount of treatment needed based on the individual needs of each patient. For patients who cannot tolerate the side effects of pain killers, TENS pain management may be a viable option. What is the Difference Between TENS and a Muscle Stimulator? How Effective is TENS for Back Pain? What is an Electronic Control Unit? How do I Choose the Best Pain Management Treatment?